Bonjour, I've had such a lazy week since our last chat. The one and only time I left home during the past 7 days was for a quick trip to the supermarche for essential supplies. Work in the garden has mainly been just watering plants in the cool early mornings or late in the evening as the bats begin their nightly hunt for food, and I did prune some roses one once or twice. 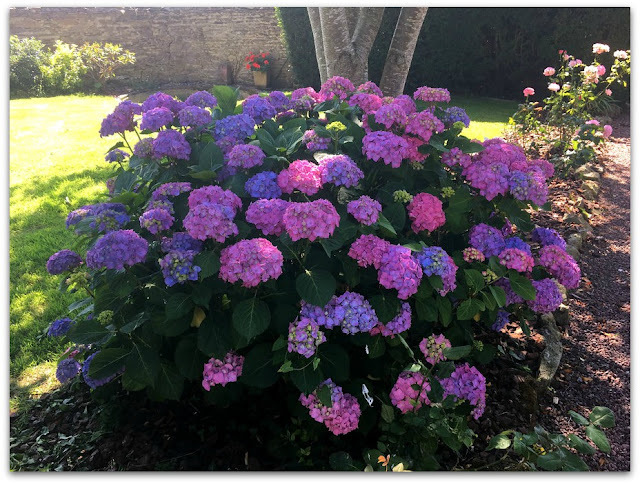 The blue/pink hydrangea is looking rather splendid this year, don't you think? 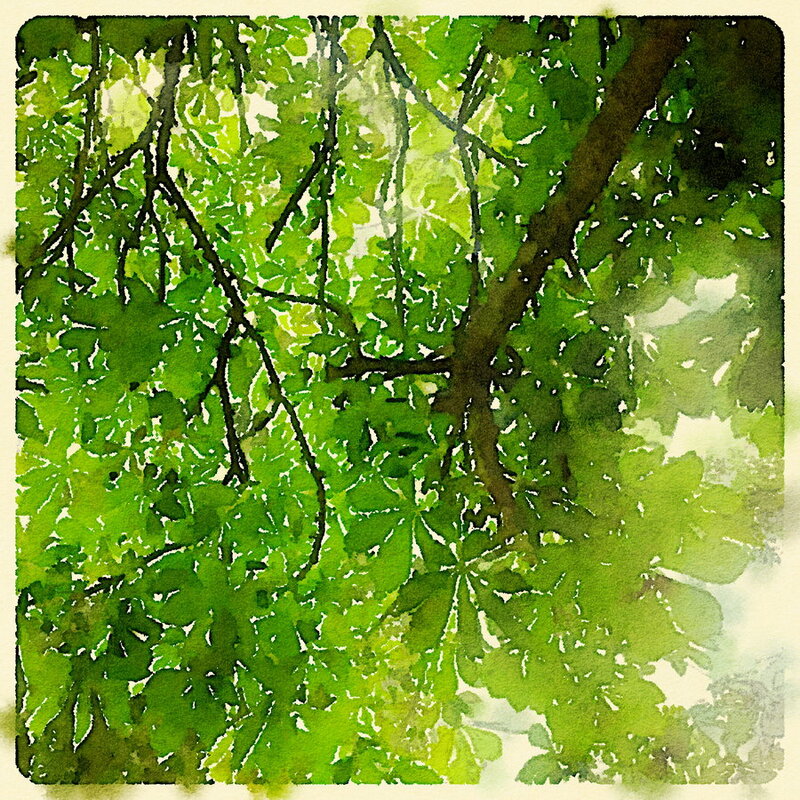 So pretty that I decided to feature it as my blog header for the rest of the summer. 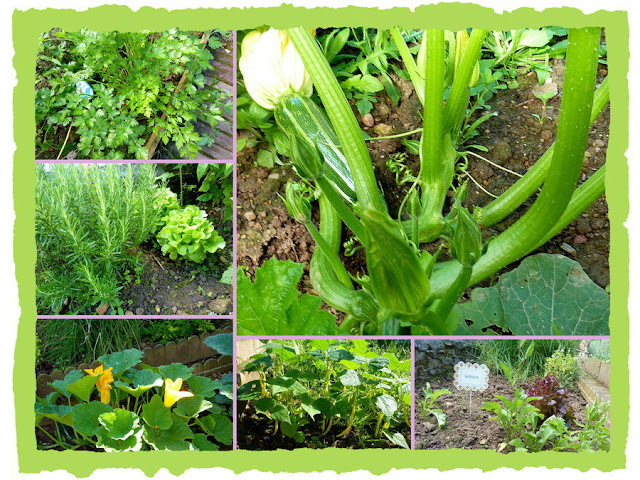 Once upon a time I used to have a potager and would toil daily amongst the courgettes, lettuces, beans and tomatoes. Now I only have a small herb bed and a few golden raspberry canes to tend to. I do miss picking fresh salad leaves for dinner in the evenings though. So, how's your summer going? Are you out and about enjoying fun activities with family and friends, tending your garden or maybe you have animals and pets to care for. Just between us - I always hankered after keeping a couple of donkeys in the back garden. I knew in my heart that it was never going to happen. Still it might have been nice. Love your new header. I love hydrangea. Thank you Maggie for your 93rd Mosaic Monday, I look forward to seeing what other blogging friends have been working on this past week. Love hearing about relaxing - now I have to try that too. 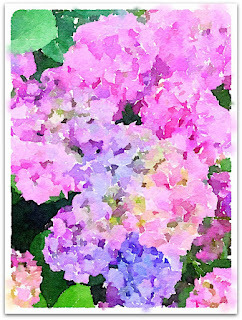 Love your new header, Maggie I need to amke a new one myself one of these days!C I love hydrangeas but would not attempt to grow them here as I know they'd be eaten by deer. Summertime is perfect for relaxing and reading. A Piece of the World was one of our book club selections, and I am hosting the conversation about it in August. I'll be curious as to what you think of it after you read it. I'll let you know and would love to hear what your Book Club members thought of it, too. Maggie - this is just what summer is for … lazy enjoyment, punctuated by naps! We are in the UK now and relishing the lack of responsibility - in that sense, our summer has finally arrived. I love your 'paintings' in this post, and the mosaic of the vegetable garden - it inspires me to get a little more creative with my mosaic frames. As always, thanks for hosting MM! Hope you're having a marvellous time in the UK, if you pop over to France let me know! Wow...that's a lovely hydrangea! Your veggies look pretty good too. I always like to grow some fresh herbs,the taste is so much stronger than the packaged variety. Have a great week Maggie - Happy Monday! Sorry I can't add the post link. I forgot to title my post before publishing! No worries, the link is working fine now.
. Happy to join in another Mosaic Monday here. Hydrangeas are my favorite flower...I oooohed and aaaaahed over your banner when I saw it this morning! Love the photos you've shared. We are having a good summer and I've been able to choose some 'less hot' days to get out! Happy MM! Love your watercolor look! The hydrangeas are gorgeous. It's hot and humid and I'm staying inside ... ice tea, a book (or more) and knitting (trying to get some holiday gifts done). Thanks for hosting! 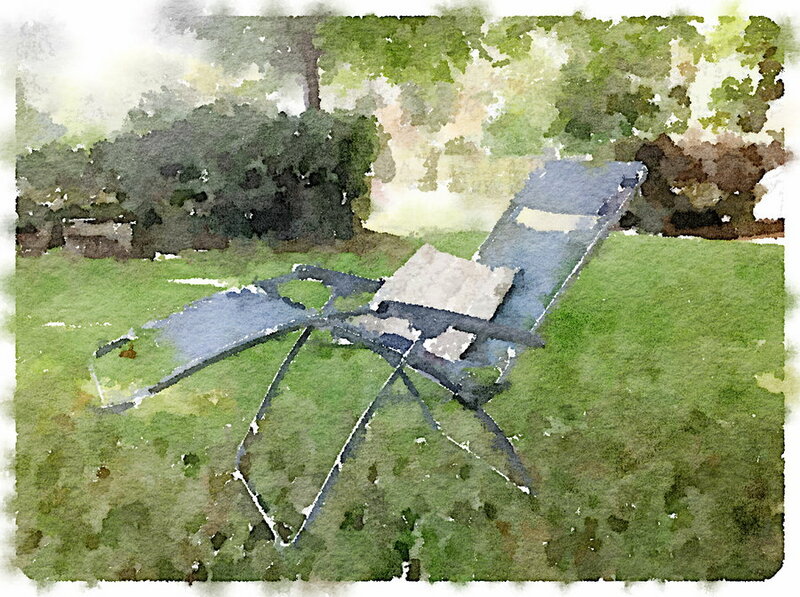 I just love the Waterlogue app on my phone, it changes photos into paintings at the drop of a hat! Those hydrangeas are magnificent, Maggie! I don't blame you one bit for using them as a header! 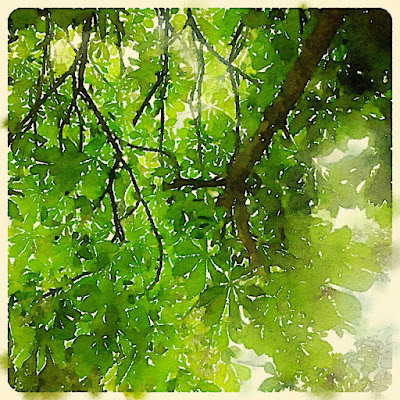 I love those images at the beginning of your blog post - are they photos turned into paintings - or paintings to begin with. It sounds like you are enjoying your summer with a host of books to keep you company. You must add Kate Morton's The Forgotten Garden. I loved it, and I've just started her book, The Lake House. Enjoy summer! Hi Jill, I use the Waterlogue app on my phone to turn photos into paintings, love it! PS: I like the watercolour effect! 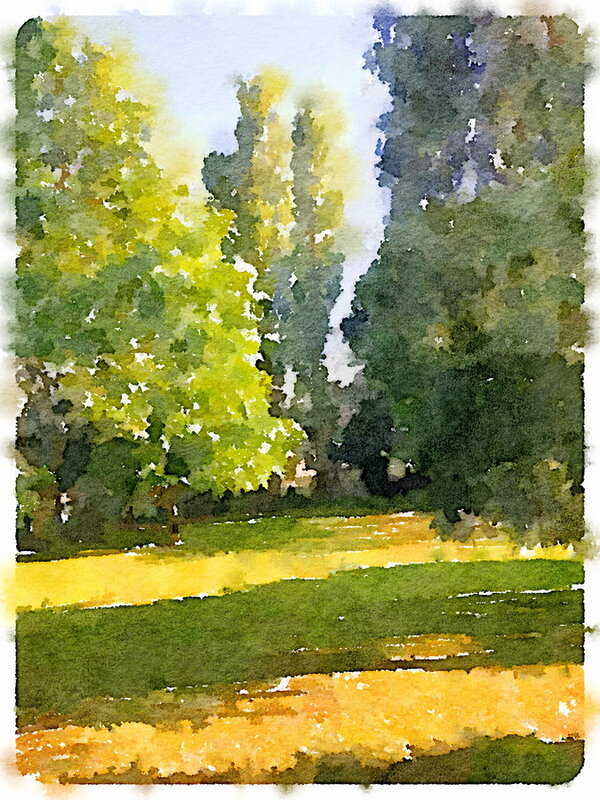 That would be the Waterlogue app on my phone, it's amazing! Your post evokes a perfect summer, with time to read, relax and enjoy the garden. That's quite a list of books you've read so far - I get so many great ideas for books to read from fellow bloggers. Hydrangeas are such gorgeous plants and I love them all. Your new header is very summery, and reminds me that I need to change mine. Those super hot days were kind of like a reverse-season hibernation ... and I think the downtime was good for me. And like you, I got a lot of reading done ! Love the two-tone hydrangea bushes.....must have the perfect mix of soil stuff (botany obviously isn’t my strong suit)..... I enjoyed your beautiful lazy summer post and thank you for all you do! A lovely post, Maggie. Your hydrangeas are so beautiful. And I love the watercolours. 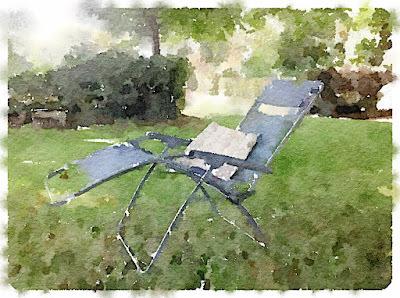 Hi Dixie, I just love the Waterlogue app on my phone, it changes photos into paintings at the drop of a hat! Oh Maggie, your waterlogues (and hydrangeas) are lovely! I especially love the one of the chaise! Hello Maggie, I have to admit to hydrangea envy. They grow here--those big white mop heads and I so want to add them to the garden, but I can't seem to get them winter over. I'll enjoy yours. We've had a bit of a heat wave here, too. I find myself inside more and succumbed to turning on the air conditioning. I've done some sewing and reading and summer is slipping by. Looks like you have been enjoying Waterlogue. It's fun isn't it? Maggie, I'm late getting my visits in. Hankering for donkeys! I love hearing that. I may have told you that my good friend has a pair of miniature donkeys on her property in the heart of Austin. You should make that dream a reality! You've the perfect spot! Summer gardening in TX is a challenge, but especially so this past week. We've had temps hitting 108 and higher. No rain in sight, which makes it even worse. Water retrictions limit the irrigiation system to one day a week. You can imagine the stress on my garden. Thanks for hosting! This is a favorite party!